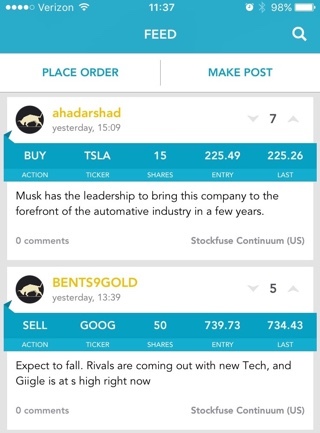 Stockfuse presents trades in a modern timeline format that should be immediately familiar to users of traditional social media platforms. Each trade submitted to Stockfuse becomes a card on the timeline. Within each card is a blue ribbon, which provides the full details of a trade, including the direction (i.e., buy/sell), ticker symbol, quantity, target price (i.e., the trader’s forecast for where the stock is headed), and the trader’s investment horizon. Below the trade detail is the trader’s investment rationale, detailing the thought process behind each trade. Stacks also provide a full range of social features, including voting and commenting. Last modified: April 11, 2016, 7:46 p.m.